What does it mean to make disciples who make disciples? Well, it may mean many different things to different people, but it all starts with seeing people in the same way that God sees them. It starts by seeing every person as someone special who’s been created in the image of God. Every individual person has been created in the image of God because God wants to have a relationship with that person. And we make disciples by being very intentional in all we do, to point others to Jesus. Making disciples who make disciples is primarily about being intentional in all of our actions and in all of our relationships to move people in the direction of being more like Jesus. We want others and we want ourselves to look and be more like Jesus. Five-weeks, ten-weeks from now, 6-months, 12-months from now, will we be more like Jesus than we are right now? Our friends or co-workers now, who don’t yet know Jesus, will they know more about who Jesus is and why it is worth it to give their whole lives to follow him? Will they know more about that in the weeks and months to come than they do right now? Here’s a helpful visual. If we were to think of a number line—this number line has positive and negative numbers on it. It’s numbered from a negative 10 all the way to a positive 10. Negative 10 represents someone who is a militant atheist. This person gets aggressive at the very thought of God. That individual represents a negative 10. A little further up the scale, we have a friend who’s heard the good news about Jesus. She may even be able to explain the good news to us, but she hasn’t yet repented of her sin and trusted in Jesus. She may be represented on the scale at a negative one or two. Zero is the moment that a person actually comes to faith in Christ. So, we have a family member who just became a Christian in the last month. She’s so excited to be a Christian, but she doesn’t know what following Jesus looks like. She would be a positive one or positive two. So, we have this scale. We can all picture the scale in our minds. We may even have friends, family members, and co-workers, who, if we were asked, we could put them at some point along that scale. Now, our job, in making disciples who make disciples, is to move that person to the right on that scale (toward the higher numbers). Now, it’s extremely important for us to understand that this is ultimately a work of God. “We” don’t do it. God does it. But God uses us as his means to accomplish this. He uses us as we open and share the Word of God with these individuals. He uses us as we are prayerfully dependent on the Holy Spirit to work. So, for our militant atheist friend who is currently a negative ten, if we could, by God’s grace, get him to the point where he would acknowledge the possibility that a supreme being exists, that would be a win. He’s moved from a negative 10 to a negative 9 or maybe a negative 8. He’s moving in the right direction. Now, of course, our ultimate goal is present everyone mature in Christ so we should have a godly desire to see this friend actually get to a zero and then to grow in Christ, but it’s still a win for him to move from a negative 10 to a negative 8. And for our family member who just became a Christian in the last month, by God’s grace, we hope that she’ll move from a positive 1 to a positive 3 in the next twelve months. We’re making disciples who make disciples by moving people to the right on that scale. So, I have two questions to leave you with. 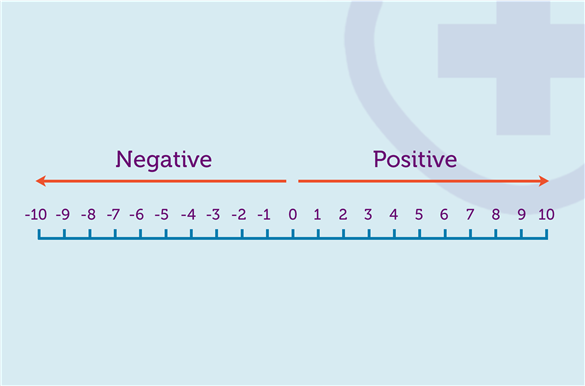 First, what number would represent where you’re at right now on that scale? Second, if you’re a Christian, what are you doing to help move others (and yourself) to the right on that scale? If we’re going to make disciples who make disciples, we have to open our Bibles and tell others about Jesus.